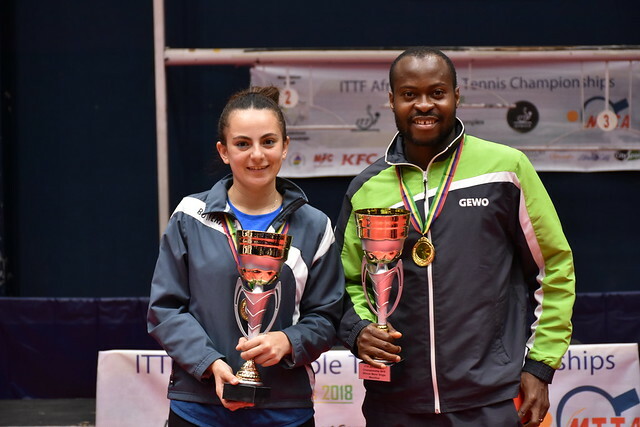 Defending champion, in search of an unprecedented fourth title; those dreams for Nigeria’s Olufunke Oshonaike at the 2018 ITTF-African Championships in Port Louis, Mauritius ended on Saturday 8th September. The no.2 seed, she experienced a shock third round defeat. Gold medallist in 1992 in Lagos, in 2002 in Bizerte and last year in Agadir, she was beaten by Algeria’s 20 year old Sannah Lagsir in six games (11-8, 5-11, 8-11, 11-4, 11-5, 11-5), a player whose name does not appear on the current Women’s World Ranking owing to an absence from the international scene. Success for Sannah Lagsir against the odds; alas for her colleague, Lynda Loghraibi, the no.8 seed, it was the reverse scenario, she was beaten by Reem El-Eraky (11-8, 17-15, 5-11, 11-5, 11-6); also there was defeat for colleague Katia Kessaci, she suffered at the hands of Dina Meshref, the top seed (11-7, 11-3, 11-7, 11-3) as Egypt imposed its authority on proceedings. In addition to Reem El-Eraky and Dina Meshref, in the third round of the Women’s Singles event there was also success for colleagues Farah Abdel-Aziz, Yousra Helmy and Amira Yousry. Furthermore, it was almost one more; Alaa Saad extended Offiong Edem, the no.5 seed, the full seven games distance, the Nigerian recovering from a three games to nil deficit to keep the hopes of her country alive (7-11, 10-12, 4-11, 11-5, 11-5, 11-8, 11-5). Alas for Nigeria there was also defeat for Esther Oribamise; she was beaten by the 2010 champion, Cameroon’s Sarah Hanffou (6-11, 11-1, 11-8, 11-4, 11-7). Impressively Farah Abdel-Aziz beat Madagascar’s Harena Dimbimiarilantira (11-6, 11-3, 11-6, 11-3); Yousra Helmy accounted for the Republic of Congo’s Ammadine Litobaka (11-1, 11-5, 11-8, 11-7). Similarly, Amira Yousry ended the hopes of South Africa’s Simeen Mookrey (11-4, 11-4, 11-5, 11-2). At the quarter-final stage Dina Meshref meets Sarah Hanffou, Offiong Edem confronts Farah Abdel-Aziz; in the opposite half of the draw Yousra Helmy opposes Reem El-Eraky, Amira Yousry meets Sannah Lagsir.